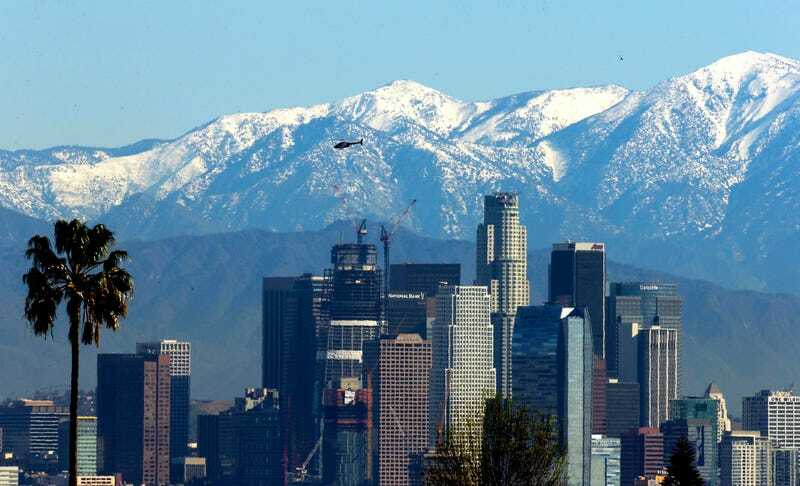 What US city is framed by snow-capped mountains today after a series of big storms? Hint: It’s not Denver. Okay, maybe the palm tree gave it away. But ever since I moved here 15 years ago, I’m still shocked at how many people don’t believe that Los Angeles gets snow. Although it does actually snow in the city of LA proper (rarely), it’s more typical to see the San Gabriel Mountains covered like this in a dusting of the white stuff. And hopefully will be even more so during an El Niño year. Further north, the Sierras are expecting up to two feet of snow this week which will help replenish our nonexistent snowpack. This week was actually a perfect storm, in LA at least: Lots of moisture and cold temperatures were followed by a weak offshore flow that produced crystal-clear skies. And some of the most incredible vistas of a city one might never think actually has a winter.